Standard economic thinking assumes that informed, rational consumers evaluate all the options available and choose one that results in the lowest overall cost. This implies that banks, being aware of consumer rationality, would compete to provide the lowest cost products (Barr et al. 2008). The mortgage market, though, is the perfect setting for asymmetric information and information failures. In it, not-very-informed consumers interact with skilled and well-informed sellers (Woodward and Hall 2012). The negative effect of this information mismatch is aggravated by cognitive behavioural factors that cause consumers to make predictable mistakes (Thaler 1985, Barr et al. 2008, Estelami 2001, Perry and Lee 2012). In a recent paper (King and Singh 2018), we examine consumer preferences for mortgages in Ireland. 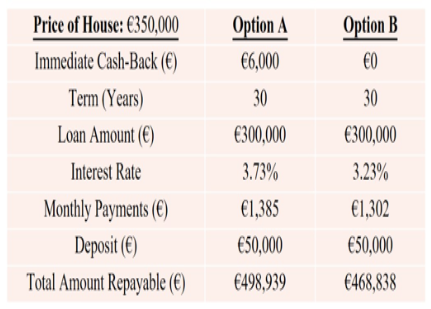 For these consumers, the average €300,000 cashback mortgage would be more than €30,000 more expensive over 30 years. To do this we conducted a series of parallel experiments with a nationally representative online panel to explore the behavioural causes of mortgage choice, and estimated the impact of advanced, behaviourally informed, disclosures and bank marketing. Cashback benefits were a feature of 44% of mortgage products in Canada, 51% of mortgages in Ireland and 54% of mortgages in the UK. 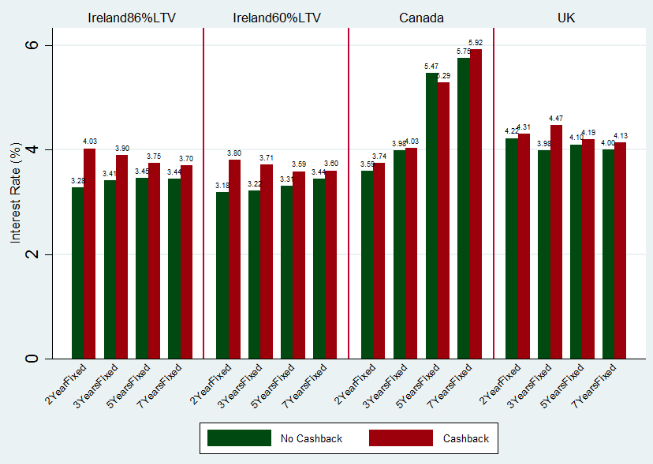 Interest rates for cashback mortgages were on average (non-weighted) 0.05% higher in Canada, 0.40% higher in Ireland and 0.20% higher in the UK (See Figure 1). For a mortgage of the equivalent of C$/€/£300,000 (US$229,000), over 30 years, this interest rate differential leads to extra repayments of C$6,729 (US$5,020) in Canada, €32,207 (US$36,400) in Ireland, and £10,635 (US$13,400) in the UK. Of course, customers may move mortgages strategically after receiving the cashback. While we cannot rule out this strategic behaviour, we have reasons to believe this is rare. There are low levels of mortgage switching and also market rigidities that reduce switching. We find that cashback mortgage customers are more likely, controlling for other factors, to have low levels of financial literacy and exhibit strong preferences for paperwork avoidance. Source: King and Singh (2018). Although the cashback feature on credit cards works differently, typically encouraging consumers to spend more each month to receive small cashback payments, we suggest that the same interaction takes place in the mortgage market. That is, banks advertise cashback features up front to encourage consumers to sign up to more expensive products. 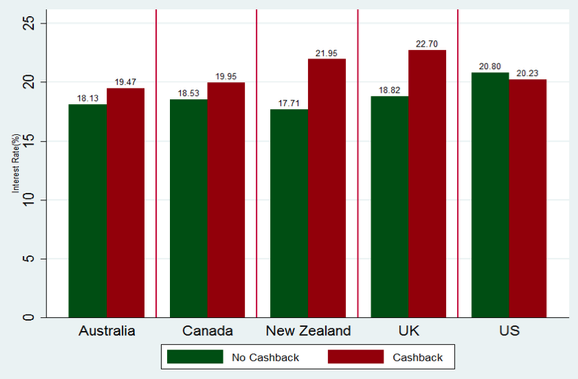 Our survey found that interest rates on cashback credit cards are systematically more expensive in Australia (1.34 percentage points higher), Canada (1.42 percentage points higher), New Zealand (4.24 percentage points higher) and the UK (3.92 percentage points higher). The US, where banking relationships are more hierarchical, is the exception (See Figure 2). For credit cards, the diligent customer who repays a credit card bill on time each month will benefit from cashback. But we expect the majority lose from cashback credit cards. When a cashback programme was started by one of the major banking institutions in the US, Agarwal et al. (2010) found that average spending increased by $79 a month, and debt increased by $191 a month in the first three months. The average cashback benefit was $25. The same study found evidence that the increase in end-of-month debt on cashback credit cards persisted. Our paper explores the role of behavioural biases, advanced disclosure, and bank marketing through three parallel mortgage choice experiments, using a representative online panel of 3,000 respondents in Ireland. Each experiment had one control and two treatment arms (simple prototype disclosure, and marketing nudge), resulting in nine experimental arms with 333 respondents distributed randomly across each arm. 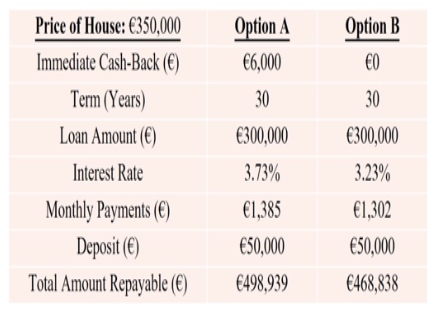 Respondents in each arm were given two hypothetical mortgage options; option A offering 2% cashback on a mortgage of €300,000 for 30 years, while option B was a non-cashback mortgage with a lower interest rate. 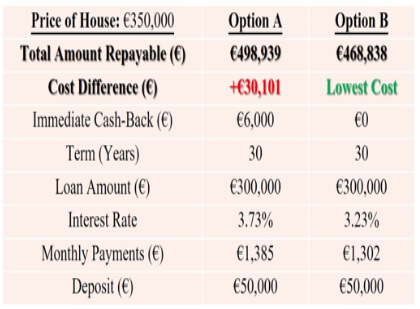 The mortgage options were chosen to represent current mortgage products in Ireland, and our presentation of product attributes mirrored the default mortgage comparison tool on the website of the Irish Competition and Consumer Protection Commission. Behavioural economics has taught us that consumers do not necessarily act rationally. There may be a range of behavioural biases that affect the decision-making of customers, leading them to choose products that may not represent the lowest cost option. We consider three behavioural factors, which are present bias, overconfidence, and riskiness and inattention. Present bias consumers are more likely to choose costly cashback mortgages, mirroring the results of Gathergood and Weber (2017) for alternative mortgage products (AMPs). Consumers who demonstrate limited attention choose expensive cashback mortgages even when the short term liquidity is the same for each mortgage option. 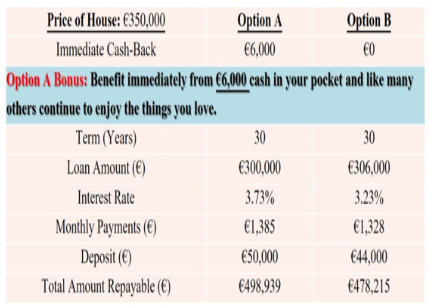 Framing of the cashback into two smaller amounts of €3,000 (paid immediately and after one year) increases the likelihood a consumer chooses a cashback mortgage compared to a single immediate cashback of €6,000. We term this result a ‘2 vs 1 framing effect’. It exists irrespective of the fact that the net present value of the staggered cashback is lower. Mandated disclosure, as currently implemented by regulators, is perceived as a remedy for issues of imperfect information (Elizondo and Seira 2014, Lacko and Pappalardo 2010, Loewenstein, Sunstein, and Golman 2014). But the evidence for its effectiveness is weak (Shu 2010, FSA 2005). In contrast, emerging research has shown that advanced and well-designed disclosures, informed by behavioural economics, can help consumers make better decisions (Lacko and Pappalardo 2010, Bertrand and Morse 2011, Hastings and Tjeda-Ashton 2008, Aggarwal et al. 2014). Borrowing an approach from some price comparison websites, we test the impact of a behaviourally informed bespoke disclosure, that represents an improvement on current regulations. Figure 3 (bottom panel) shows the exact disclosure. We put the total repayment amount on the first line and specifically illustrated the relative total cost of the two mortgages. This is something that many comparison websites do for insurance or broadband products. Of particular interest to regulators are our findings on disclosure. Behaviourally informed disclosure (as above) reduces the number who choose expensive cashback mortgages. Disclosures are particularly effective for prospective buyers, where the advanced disclosure reduces likelihood of choosing a high-cost cashback mortgage by between 6.4% and 10%. Despite this finding, across three experiments, a minimum of one in five consumers still choose the cashback mortgage after seeing the disclosure. This suggests a robustness in demand for cashback products and a limit to the effectiveness of this type of disclosure. Clever marketing, distraction, and lack of transparency through initial teaser rates, extended loan maturities, balloon clauses and adjustable rates (Sunstein et al. 2016, Wilkinson 2013, McCoy 2005, and Rowe et al. 2015) help lenders manipulate mortgage market. We assess whether the choice of expensive cashback mortgage responds to basic promotional massages (Figure 4). We simply bring the mention of the cashback to the front, and provide a short nudge to encourage take up of the cashback product. The wording mirrors language found in typical cashback promotional literature. Our marketing skills are poor, and we do not have a marketing budget, any effect we find should be considered a lower bound. In terms of marketing we find that simple marketing increases the number of respondents who choose a cashback mortgage, but only for prospective buyers (those who wish to take out a mortgage or buy a house in the next 15 years) rather than the entire sample. This suggests that marketing is particularly effective for the target market of banks. As Richard Thaler puts it, these 'sludges' can encourage self-defeating behaviour, such as investing in a deal that is too good to be true (Thaler 2018). We believe cashback financial products fit well within this definition. Banning cashback mortgages may encourage banks to compete more honestly on interest rates. Consumers who choose cashback mortgages demonstrate lower financial literacy and dislike paperwork, and so may be less likely to switch out of expensive mortgages. Marketing strategies, which may disproportionally attract more risky customers with low levels of financial literacy to certain banks, may increase risk in the financial sector. Agarwal, S, S Chakravorti, and A Lunn (2010), "Why do banks reward their customers to use their credit cards?" Federal Reserve Bank of Chicago working paper 2010-19. Agarwal, S, S Chomsisengphet, N Mahoney and J Stroebel (2014), "Regulating consumer financial products: Evidence from credit cards", The Quarterly Journal of Economics 130: 111-164. Barr, M S, S Mullainathan and E Shafir (2008), "Behaviorally informed financial services regulation", Asset Building Program policy paper, New America Foundation. Bertrand, M, and A Morse (2011), "Information disclosure, cognitive biases, and payday borrowing", The Journal of Finance 66: 1865-1893. Elizondo, A, and E Seira (2014), "Are information disclosure mandates effective? Evidence from the credit card market," Banco de México working paper 2014-18. Estelami, H (2001), "Determinants of discount rates in consumer credit decisions", Journal of Marketing Theory and Practice 9: 63-73. FSA (2005), "KeyFacts Quick Guidelines: Research Findings", UK Financial Services Authority technical report, prepared by D V L Smith. Gathergood, J, and J Weber (2017), "Financial literacy, present bias and alternative mortgage products", Journal of Banking & Finance 78: 58-83. Hastings, J S, and L Tejeda-Ashton (2008), "Financial literacy, information, and demand elasticity: Survey and experimental evidence from Mexico", NBER technical report. King, M, and A P Singh (2018), "Conned by a cashback? Disclosure, nudges, and consumer rationality in mortgage choice," Trinity economic paper 1118. Lacko, J M, and J K Pappalardo (2010), "The failure and promise of mandated consumer mortgage disclosures: Evidence from qualitative interviews and a controlled experiment with mortgage borrowers", American Economic Review 100: 516-21. Loewenstein, G, C R Sunstein, and R Golman (2014), "Disclosure: Psychology changes everything", Annual Review of Economics 6. McCoy, P A (2005), "A Behavioral Analysis of Predatory Lending," Akron Law Review 38: 725. Perry, V G. and J D Lee (2012), "Shopping for a Home vs a Loan: The Role of Cognitive Resource Depletion,” International Journal of Consumer Studies 36(5): 580- 87. Rowe, B, H Wright, and R Wootton (2015), "Understanding consumer expectations of the mortgage sales process" Financial Conduct Authority technical report. Shu, S B (2010), "Consumer Behavior in Relation to Truth in Lending Disclosures", working paper. Sunstein, C R (2016), "Fifty Shades of Manipulation", Journal of Marketing Behavior 1(3-4): 213-244. Thaler, R (1985), "Mental accounting and consumer choice", Marketing Science 4: 199-214. Thaler, R (2018) "Nudge, not sludge", Science 361(6401): 431. Wilkinson, T M (2013), "Nudging and manipulation", Political Studies 61: 341-355. Woodward, S E, and R E Hall (2012), "Diagnosing consumer confusion and sub-optimal shopping effort: Theory and mortgage-market evidence", American Economic Review 102: 3249-76.